WWW.DAVIDEUCARISTIA.COM The Eucharist lived and taught trully. Living in the Eucharist the supernatural coexistence and union of the Virgin Mary and of all souls in sanctifying grace with Jesus Christ, becoming one Body and Blood, Soul, Humanity and Divinity with Him, as promised in Jn 6:56,12:26,14:3,17:21-24. Attention! By accesing and using this website or its contents you acknowledge having read, being informed and to accept all what is said in the LEGAL NOTICE related to intellectual property rights, license for sharing, etc., and also with regards to PRIVACY and cookies policy. If you want to share this article, please use the buttons to share enabled for that, or well copy the address from the navigation bar of the browser and paste it wherever you need it; but DO NOT COPY AND PASTE THE ARTICLE, neither all its text nor part of it, elsewhere: that's illegal and by doing so, those people no longer will need to access my website to read. 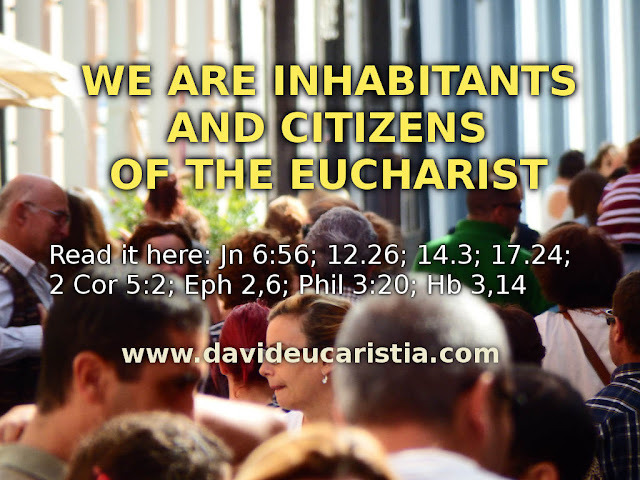 Having proved that we inhabit supernaturally in the Eucharist with Jesus Christ, by the will and grace of Him (clic here to read). 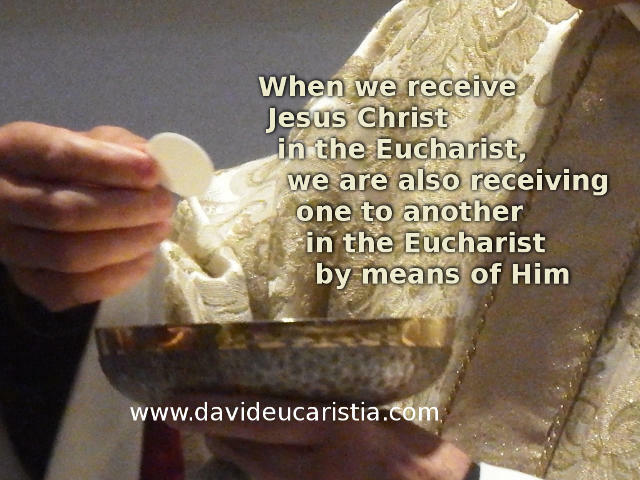 It is a simple logical deduction that, whenever we receive Jesus Christ in the Eucharist we also receive one another in Him. Because all that dwells in Him comes along with Him in the Eucharist. Each time we receive Communion we receive also everything that exists and lives in God: "In God we live and move and exist" (Acts 17:28). ♦ 1st. Jesus Christ promised four times in the Gospels that we would be and dwell with Him wherever He was: Jn 6:56; 12:26; 14:3; 17:24. ♦ 2nd. The Official Catechism of the Church teaches that in the Eucharist we live anticipatedly the promises of Heaven (CCC 1326, 1331, 1340, 1402, 1419, 2837). ♦ CONCLUSION. In the Eucharist we live by anticipation our promised coexistence with Jesus Christ in Heaven. I, David, am the author of this Message. The Eucharist has been my Master and I have been its disciple along all the way: now listen to what I have learned from It, and everything It has taught me. Many people are still not aware of the great gift that God is sharing them through me, but every day they will be more. Hear my message and apply it, do not leave it aside as something without use. I do not presume of myself as if I were something or someone special; before the eyes of the world I am nothing. But I make this advice because they will come many that will try to attribute this -my Message- to themselves, trying to usurp and take away what God has entrusted to me, wanting to usurp their development and description, as if they themselves would have discovered it now, after I've lived it since 2000 onwards: they will read and take of mine and then they will present it as their own; in fact they are already doing, leaving me -its author- aside; they appropriate my ideas and then share and publish them as if they were their own (but without mentioning me, without saying from where or by means of whom they knew, hiding to the souls the source from which this came out so that they can not find it out). I know, but I still keep on and I will continue to publish, sharing for the good of souls, for this message to be known and lived: it is what I love most, and why I share it for free and put at the disposal of the people all this message of salvation. That it may be lived and shared, it is my payment; and my hope is that one day it may be known and lived in the whole Church; It is what I want, and I know that it will a reality one day. I am making it available to you and to the Church so that you can share and take advantage of it; but, when necessary, please refer to its source, and guide the souls here to read it as it is, in its authentic version, as I taught it. I am not responsible for the manipulations and misrepresentations that others might make of this message, and how they teach it to others, if they do different from what I have taught and is described here (do not trust everybody, because many could contaminate this message with things that I've never taught and, instead of clear water, they'll try to offer you polluted water). On this website, and only here, it is the true description of this Spirituality in its original version, and I am not neither I take responsibility for how others could live or share it. Today November 22, 2015, Solemnity of Jesus Christ the King, we started to collect supports with respect a request that has already been sent to the Pope Francis in writing. This proposal and request of definition of dogma, addressed to the Holy Father and to all the Bishops of the Catholic Church, proposes to the Church the explicit recognition of that, in the Eucharist, by the will of Jesus Christ (implicitly expressed in the Gospels), and in accordance with the Magisterium of the Church itself, are also present or participate (each one in proportion to the degree of purification and grace reached) all souls in sanctifying grace throughout the Universal Church of every age: all the souls of Heaven, Purgatory and Earth, occupying a very first and very special place the Blessed Virgin Mary. 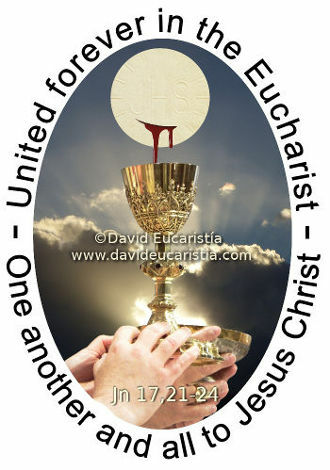 Living in the Eucharist, in all its fullness, the supernatural union and cohabitation (in proportion to Grace and Purification attained by each one) of all souls in Sanctifying Grace state with Jesus Christ in the Eucharist. Please, consult John 12:26; 14:3; 17:24; and the Official Catechism of the Catholic Church, items 1323, 1326, 1331, 1340 and 1402. When we receive Jesus Christ in Communion, we do not only receive Jesus Christ, but also all that is, or that lives in, or that belongs to Jesus Christ; we receive the whole Universal Church of Heaven, Purgatory and Earth; since whereever is the Vine they are also the branches with Him. The Eucharist is the Universal Bridge that cancels forever the barriers of space and of time between all souls, putting them in Communion with each other, and all of them with God. Catholic Catechism, article 1419: «Having passed from this world to the Father, Christ gives us in the Eucharist the pledge of glory with him. Participation in the Holy Sacrifice identifies us with his Heart, sustains our strength along the pilgrimage of this life, makes us long for eternal life, and unites us even now to the Church in heaven, the Blessed Virgin Mary, and all the saints». © Copyright, all rights reserved, by davideucaristia@yahoo.es, 2012-16. Con la tecnología de Blogger.